In the majority of the studies in which skeletobiont communities are described, they are found on the exteriors of shell substrates. Skeletobiont communities that inhabited cryptic environments inside some of these same organisms are poorly known. In those instances where cryptic skeletobiont communities have been described, they are on a much larger scale (i.e., cavities in bryozoan reefs and under hardground ledges) and do not include smaller cryptic communities. The Cincinnatian Series of Ohio, Indiana, and Kentucky has many examples of these cryptic communities. Skeletobionts encrusted the interiors of gastropod, monoplacophoran, and nautiloid shells post-mortem, and are mostly made up of sheet and runner-type bryozoans and cornulitids, along with some craniid brachiopods and microconchids. Interestingly, in contrast to other studies on skeletobionts, the majority of the encrusters in our study do not appear to have been concerned with the location of the host aperture. Only the runner-type bryozoans (Cuffeyella and Corynotrypa) appear to have some directional preference, generally increasing their crypticity and branching away from the aperture. However, increasing crypticity is not always the case; sometimes the bryozoans branch parallel to the aperture or even grew towards it. Aside from shedding light on the life habits of these encrusters, these cryptic skeletobionts also inadvertently preserved their hosts through bioimmuration. Bioimmuration is a type of fossil preservation in which a skeletal organism overgrows another, preserving its negative relief. These cryptic communities not only tell us more about the organisms living in these isolated cavities, but they also have preserved detailed external and internal molds of their host aragonitic fauna. This provides information about shell morphology that would have otherwise been lost to dissolution. Because of the abundance of skeletal bioimmuration in the Cincinnatian, a comparison of cryptic to exposed skeletobionts living in the same environments can be made. 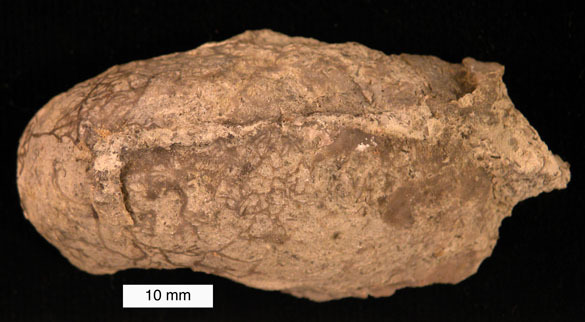 The header photograph is of an internal mold of a monoplacophoran mollusk. 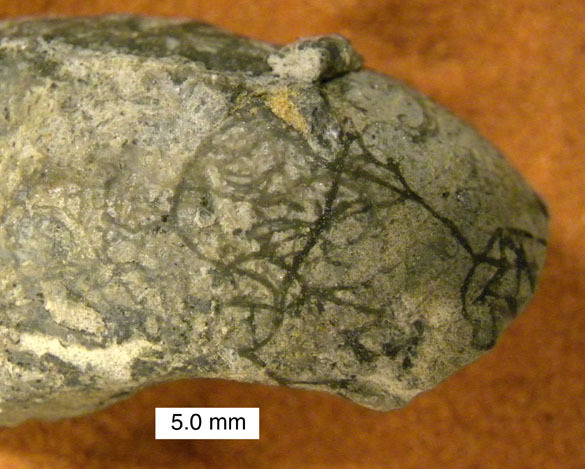 At the left you can see the branching runners of the bryozoan Cuffeyella, shown in closer view below. This is a view of the underside of skeletobionts that grew inside a nautiloid conch. The conch dissolved, leaving the undersides of various encrusters. 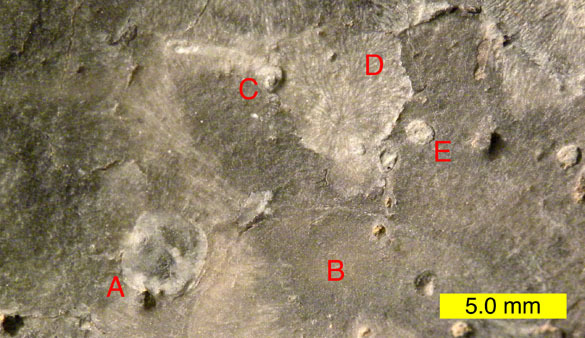 A = the inarticulate brachiopod Petrocrania; B = sheet-like bryozoan; C = a rare microconchid with an extended apertural tube; D = another sheet-like bryozoan; E = one of many Trypanites or Palaeosabella borings. 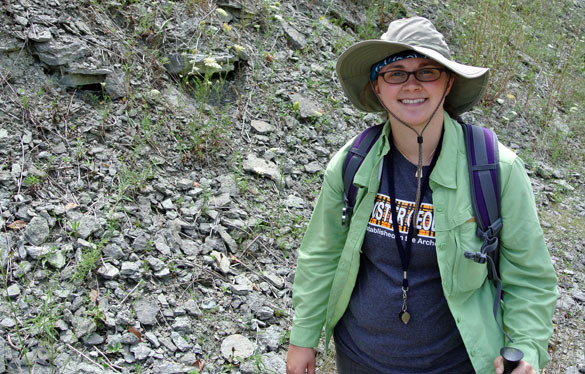 Kit Price (’13) on one of her outcrops in Indiana (C/W-149) on July 28, 2012. (regarding caption on last photo). It wouldn’t be C/W-147. It would be C/W-148, 149, or 111. I think I remember it being the second stop (C/W-149) but you should be able to tell by the time stamp on the photo! You’re right! Changed it to C/W-149.